Club Car, a manufacturer of golf cars and light utility vehicles, demonstrated the versatility and functionality of such vehicles for municipal and other government fleets. The term “golf cart” is really a misnomer when applied to the scores of highly functional, light utility vehicles joining municipal fleets across the country. Though small in stature, these pint-sized workhorses are beginning to fill the gaps in fleets where manpower isn’t enough, but full-sized trucks would be impractical or cost-prohibitive. Productivity aside, by adding the right vehicles to a fleet, managers are seeing positive returns, both economically and environmentally. At the release of their new Carryall series, representatives for Augusta, Ga.-based Club Car, a manufacturer of golf cars and light utility vehicles, demonstrated the functionality of such vehicles for municipal fleets. “There is a wide range of [municipal] applications we’ve seen,” Kurt Meyer, the commercial and industrial marketing manager at Club Car, said. He added that municipalities use carryalls for parks and recreation departments, grounds maintenance, event coordination, sanitation as well as in wastewater treatment facilities. “We say [applications range from] airports to zoos,” Meyer said. One factor limiting widespread usage of these types of vehicles is the notion that they aren’t powerful enough to serve municipal needs. But Meyer counters, saying that, as technology in the industry has advanced, it is more accurate to think of these vehicles as light trucks. “This powertrain was designed for torque and for range,” Meyer said, “[the electric vehicles] have a maximum range of about 85 miles… and [have] enough torque to pull heavy loads up steep inclines. These were designed to be real work vehicles from the start.” In the photo at right: Two models in the Club Car Carryall vehicle lineup. Photo by Derek Prall/American City & County magazine. 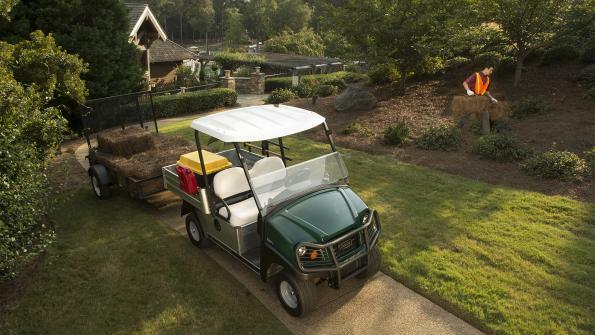 Club Car’s Carryalls are powered by either electric or gas engines. Both are designed for power, range and efficiency. Subaru 14-horsepower, 404-cc single-cylinder overhead cam engines power the gas models. Electronic fuel injection offers automotive performance. The engines feature splash lubrication systems that eliminate the need for oil filters, making them less expensive to maintain and avoid the issues with oil filter disposal. Without the need for a choke or a carburetor, engines start with the turn of key, even in cold climates. The electric engines feature new IQ Plus technology, which puts energy back into the battery when the brakes are applied. Regenerative braking increases the range of vehicles, and extends the life of a single battery charge. With a new high-frequency system, Club Car’s electric engines charge at 92 to 95 percent efficiency, exceeding the industry standard of 82 percent. The onboard charger allows for a vehicle to plug into any available outlet, and a voltage range of 85-265 volts makes the charger universally functional. Municipal authorities across the country are adding these types of vehicles to their fleets. Dallas uses Carryalls to support the city’s parks, police department, zoo and water district. Arlington, Texas, has converted Carryalls to police and ambulance vehicles for use in their sports arenas. Massillon, Ohio uses them in the water treatment plant, and Cranberry Township, Pa., employs Carryalls in their Parks Department. A benefit these departments see by switching is a decreased environmental impact. Averaging just under 40 miles to the gallon, gas-powered Carryalls are more fuel-efficient than traditional work trucks, cutting down on the carbon emissions generated from exhaust. Electric vehicles, of course, generate no emissions, and making this switch is often incentivized by state and federal subsidies. Transitioning from a traditional fleet to one incorporating light utility vehicles almost always leads to some sort of cost savings, not only in reductions in fuel purchases, but in insurance, licensing and maintenance costs as well. While every fleet is different, Club Car estimates each light utility vehicle replacing a traditional truck could save up to $5,000 annually. Join American City & County’s Assistant Editor, Derek Prall, as he takes a test drive in one of the new models in Club Car’s Carryall series. Kurt Meyer, commercial and industrial marketing manager for Club Car, explains the Carryall’s new features, as well as the municipal applications of the vehicles.